Jack Howard should be a familiar name to many of you photographers as he is the Editor of PopPhoto.com/Popular Photography & Imaging where he tests and reviews cameras, lenses, software and a multitude of camera gadgets. HDRI photography (high dynamic range photography) is a growing phenomenon of interest in the photography field. Simply put, it is a method by which the photographer produces an image that has more dynamic range than that which is possible with normal film or digital processes. In extreme, it produces a surreal image; however, used judiciously it opens up the shadows and recovers highlight detail in an image. Briefly, the process involves taking a series of images at varying exposures while keeping the f-stop and focus constant and varying only the shutter speeds. This procedure produces a range of exposures that at some point expose correctly for the shadows but not the highlights, a “normal” exposure, and at another point exposures for detail in the highlights but not the shadows. Once done, the selected software chooses the correct exposure for each area in the image and mixes the areas to produce an image that has a wider dynamic range than is possible with a single exposure. Finally, tone-mapping pulls the assorted areas back into a luminance range our eyes and our perceptions consider to be more normal. Obviously, this normally involves using a tripod and having a stationary subject, as any movement between each exposure can only contribute to blurring and the failure of the image. Surrealism is easily achieved in HDRI photography through a number of software and procedural choices. Making the photograph look “right” with tone-mapping is where a discerning eye and more than a bit of art comes in. Getting a new book from Rocky Nook Press is always a joy to me because of the high quality of the reproduction of images in their volumes. As a photographer, the quality with which a book image is reproduced is extremely important to me. First comes the quality of the original reproduction, and then I’m concerned with the lifespan of the paper it is printed on. With these volumes printed on acid-free paper I am comforted by the thought that if I return to one of their publications in a year or three or more I can expect to see and handle pages and images that will be as fresh in reproduction as they were on my first look. Jack Howard begins by explaining that on our regular computer screen or on the printed pages of a book, we cannot actually see the full scope of high dynamic range imaging. Very few individuals possess the quality of computer screen to actually take advantage of the total product of HDRI; instead, we view a tone-mapped version that attempts to cram or compress all the brightness (luminance) into a smaller space that can be managed by either the screen or the printed image. With that in mind he explains that even with the most basic DSLR equipment it is possible to do HDRI work. Even basic DSLR’s have the manual capability to set exposure in such a way that the f-stop and focus can remain fixed while adjusting the shutter speed which provides the variables in the exposure range from under to over exposure of the subject. Most point-and-shoot cameras lack this capability. In addition, because the process of HDRI photography depends upon several images being in the same position or focus, then a tripod becomes a necessity, and bracketing burst capability in the DSLR a highly desirable function. With the tools explained and in hand, he devotes a bit of time to the basics of photographic composition, and then discusses the best lens types for HDRI work. Each lens type produces a distinct “look” to the photographic image and choosing that “look” can very well be part of the developing style of the photographer. The subject of whether to shoot in RAW or .jpeg is covered. Each has it’s advantages and disadvantages, so the basic recommendation is that if the photographer’s camera has the capability, the basic images in the exposure bracket should be made with both simultaneously. Metering for an HDRI bracket can be tricky and Jack Howard discusses the various methods of metering and the advantages and disadvantages of each type. Download sites for a number of HDRI software programs are given, but the programs are not included as a CD with the book. The reasoning is that based on the length of time it usually takes to produce a book, the software will have been revised during the production period. Having the photographer download the software guarantees that the latest version is what the photographer works with. A number of software types are mentioned and demonstrated. They include Photoshop CS3, Photomatix Pro 3.0, FDRTools Advanced 2.2, and Dynamic Photo HDR 3.x. Not all of these are available in both Mac and PC versions, so the appropriate software should be chosen to match the photographer’s computer platform. Once the photographer has created an HDRI version of their selected image, then tone-mapping should be applied to their product. This is necessary to make it possible to handle the image with conventional viewing and printing media because the image will otherwise have problems with over-saturation, hyper-vividness, and out-of-gamut warnings. Of particular interest to me were the set-up procedures for Photoshop, Bridge, and Adobe Camera Raw as the easiest methods for correcting tone-mapped images that have an initial flat appearance and lack either a real black point starting or white point ending. This legitimatized the process I had worked out for myself while using an earlier version of PhotoMatix Pro while previously experimenting with HDRI photography. It also encouraged me to update my PhotoMatix Pro 2.4.1 to version 3.0.3. 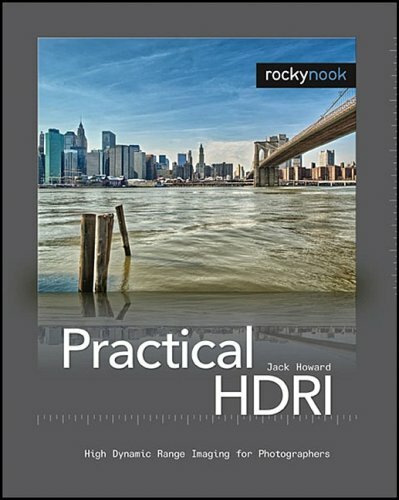 If you are looking for a straightforward introduction to HDRI photography–and can do it without the necessity of a precise-step-by-step procedure where both you and the instructor have identical sets of variably exposed copies of the same image to work with–then Jack Howard’s book is an excellent choice. As an author, Jack Howard seldom applies an aesthetic judgmental qualification to the result of a decision you might make in the adjustments of the software. Rather, his approach is that “if you do A, then B is going to happen, and that may or may not be what you want.” He demonstrates HDRI techniques on a multitude of different images producing results from surreal to extended-normal. He allows the photographer to decide which approaches best fit their philosophy of imaging. He encourages the photographer to experiment and to apply his or her own aesthetic judgment to the product. This volume is 170 pages, well illustrated, beautifully printed, and is in paperback format; it is a good addition to the bookshelf of both the beginning and intermediate photographer.